Using a sharp knife, make small incisions all over the lamb leg and insert slivers of garlic, preserved lemon and the leaves from half the rosemary. Rub with olive oil and season liberally. Roughly cut the unpeeled potatoes into small cubes and place in a large roasting tin. Using the flat of a knife, lightly crush the unpeeled garlic cloves and add to the potatoes, along with the lemon zest and the remaining rosemary. 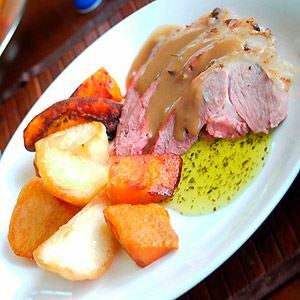 Place the lamb on top of the potatoes and roast for approximately 1 1/2 hours for medium-rare (if you have a meat thermometer, it should read 55–60°C). While the lamb is cooking, prepare the vegetables. Blacken the capsicums over a naked flame or under a hot grill, then place in a bowl, cover with plastic film and leave for 10 minutes. Peel off the blackened skin and discard. Cut each capsicum in half, remove the seeds and cut the flesh into strips. Bring a large saucepan of salted water to the boil. Add the halved chat potatoes and simmer for 5–8 minutes, then remove and transfer to a bowl. Add the baby carrots to the simmering water and cook for 3 minutes. Drain and add to the bowl with the potatoes, then toss with a little olive oil and salt and pepper. In another bowl, toss the onions, leeks and asparagus with a little olive oil and salt and pepper. Heat the barbecue. 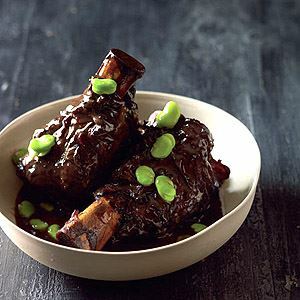 When the lamb is ready, remove from the oven, cover loosely with foil, and leave to rest for 20 minutes. Meanwhile, chargrill all the vegetables on a hot chargrill pan or the grill plate of your barbecue, turning them a couple of times, until cooked. 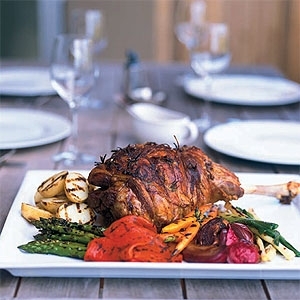 To serve, place the lamb on a platter, surround with the vegetables and squeeze over a little lemon juice. 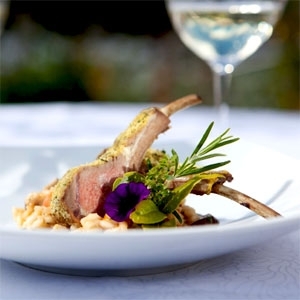 Use a very sharp knife to carve the lamb into slices about 1.5 cm thick.